Sagami Stout is a 5% stout beer from Koganei Shuzo, makers of the Sagami Beer range, based in Atusgi, Kanagawa. Like the rest of the Sagami Beer range, this beer only has a shelf life of about three months and can seldom be found outside of the restaurant and online shop; however, after a short trip to Yokohama, and World Gourmet, I managed to pick up a bottle. Sagami Stout can be found in bottled form and sometimes on draft at places outside of the brewery restaurant. Nice deep colour with an off-white head. With such a short shelf life, it has been very difficult to find any Sagami Beers for drinking outside of Kanagawa, let alone in other parts of Japan. When I came across Sagami Stout, I had to double check online to make sure it wasn’t a mistake. After being reassured that this bottle hadn’t been forgotten out back and then dumped on the shelf, it was a quick purchase and review – didn’t want the beer to go off between buying it and getting home. Sagami Stout poured out a deep brown colour though appeared black in shadows and low-light. There was an off-white, almost tan-like, head that clung to the side of the glass as the beer went down. The aroma was on the harsh side of malts, with some astringent, coffee-like qualities to it as well as some sweet malts too going on. Perhaps it was just me, but there was also an edge of creaminess to it as well. The body though was a tad watery for my liking, similar to someone taking an espresso and watering it down. Moreover, the creaminess that was present in the aroma made a strong appearance in the body and took the sweetness levels ever higher. It quickly settled down to being a bland stout and finished off with a minute amount of bitterness in the aftertaste. 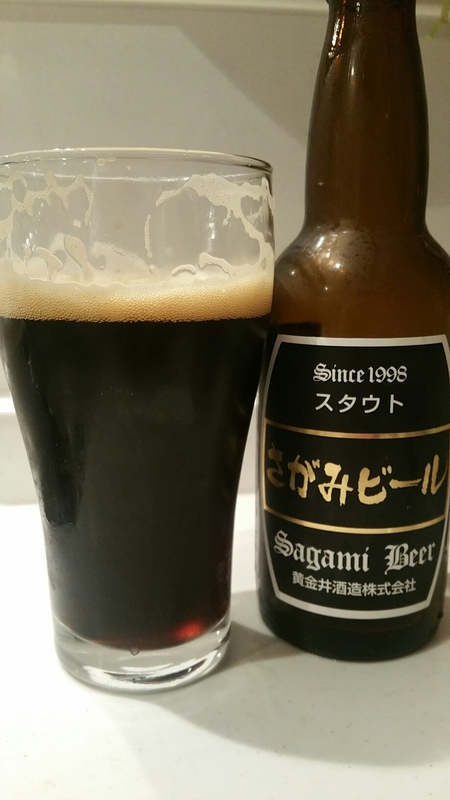 Sagami Stout is tough to recommend as it failed to tick all the qualities I like in a stout. Give it a miss.